Nicklaus North will be represented by two teams at this year's Jack Nicklaus Cup Matches in Nashville, TN, October 4-7. This annual Pro-Am event brings together Jack Nicklaus designed courses from around the world to compete against each other. A season of record high results! Arbutus Ridge shares their 2015 statistics, projects, and strategies along with why it matters. The Amazing Race Canada finishes at Nicklaus North in Whistler! 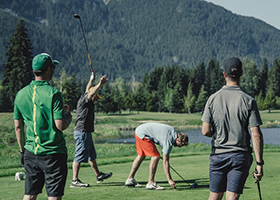 Filmed on May 28th, the finale of the Amazing Race Canada (season 3) ended on the 12th hole at Nicklaus North Golf Course, where the winning duo was greeted by host Jon Montgomery and other contestants. Read on to find out what happened "behind the scenes"! By Brad Ziemer: They both made early playoff exits, but that certainly should not diminish the solid rookie seasons Abbotsford natives Nick Taylor and Adam Hadwin enjoyed on the PGA Tour. And it seems a good bet that they will soon have some B.C. company on the Tour. By Brad Ziemer: At the age of 15 years, four months and two days, Ko became the youngest player to win a LPGA Tour event. She did it in grand style before a huge gallery that rooted her on every step of the way. Ko beat a field that included almost all of the top female players in the world. She won the tournament by three shots, but as an amateur had to pass on the winner’s cheque of $300,000. That went to runner-up Inbee Park of South Korea. Now Ko & Company are back.